Celebrating its 30th anniversary, North American Dismantling Corp., in Lapeer, Michigan, travels across the country to remove structures, accepting the challenging projects that require expertise. powerhouse projects, one in Brillaint, Ohio, and another in Denver, Colorado. 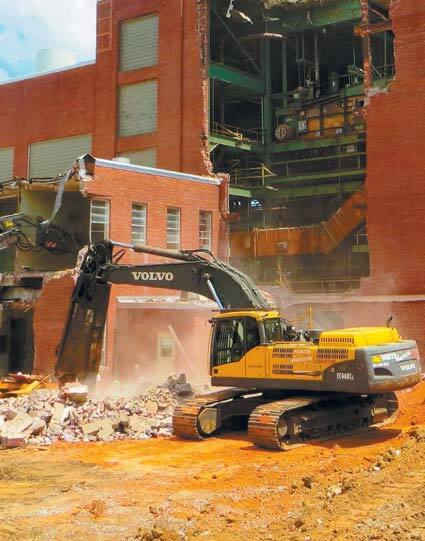 It also is demolishing an old plastics plant in Washington, West Virginia. 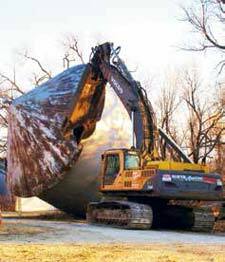 “If the job is big enough, we will travel there,” says Marty Radelt, Purchasing Director of North American Dismantling. “Leads come in from various types of advertising methods, one of them is our own website,” Seagraves said. “In order to get pre-qualified, you have to have an excellent safety record. That’s our lifeline, and we take it very seriously. In addition to rigorous employee training, another big contributor to our excellent safety record is the type of specialty equipment that we use. The more the machine can do, the less the men are in harm’s way.” Radelt reports that it may be hard to obtain a first job with a new customer, but once North American Dismantling successfully completes that project, the owner will bring the company back for other demo jobs. “Once we do these difficult jobs, we are on their bid lists,” Radelt says. “We are our best marketing people.” On every job, North American Dismantling brings expertise in engineering, environmental assessment, remediation and specialty construction. Crews analyze, define and evaluate a project, before developing and then implementing the most cost- and time-efficient methods for completing the job. The company is fully insured and is capable of bonding any size demolition project. The company completes the work with its own employees, a core group of about 75 people, which have worked with North American Dismantling for 15 or more years. It will bring in additional union personnel as necessary. The company will subcontract and supervise environmental assessment and abatement. Asbestos abatement may take six months to complete, before North American can start tearing down the buildings. Rick Marcicki, President of North American Dismantling, began the company in 1984, starting off by demolishing houses. He then moved on to commercial and industrial projects, while continuing to tear down houses, about 400 last year in Flint, Michigan. Currently, the company has focused much attention on power industry and automobile projects. “We do a lot of automotive strip outs for the big three,” Radelt says. The company also has completed projects for Toyota and Honda in Indiana and Tennessee. At a plant with a full assembly line, North American can go in and gut the building to prepare for a new assembly line or surgically remove portions of the plant’s equipment without disrupting operations. Typically, the change outs occur during the summer to prepare for producing the new auto models. There might be complete strip-outs of conveyors, paint systems and welding areas. “It’s aggressive, weekends, burn the midnight oil, three shifts if necessary to get the work done,” Seagraves adds. 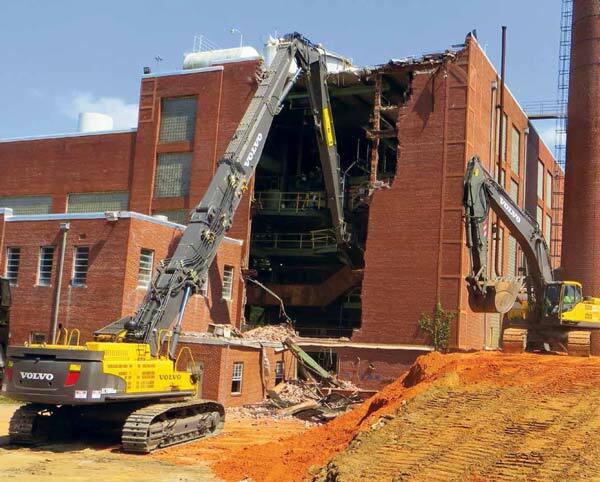 “We excel at this type of work.”North American Dismantling also has a strong track record of demolishing stadiums both for universities and pro clubs, including the Crisler Arena retrofit at the University of Michigan in Ann Arbor. And it is focused now on powerplant projects. As governmental regulations raise emission standards, many utilities must upgrade. 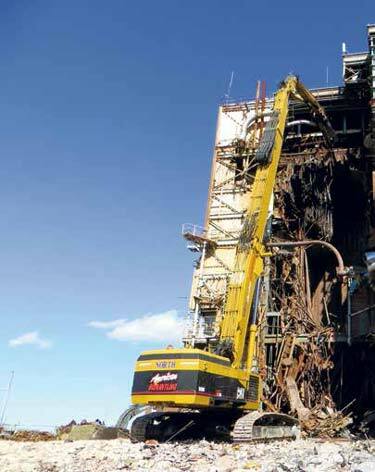 Some of North American Dismantling’s projects require heavy machinery with a high reach, while others, working inside a plant doing a strip out need smaller equipment. “We have a wide range of diverse equipment in our fleet,” Seagraves says. 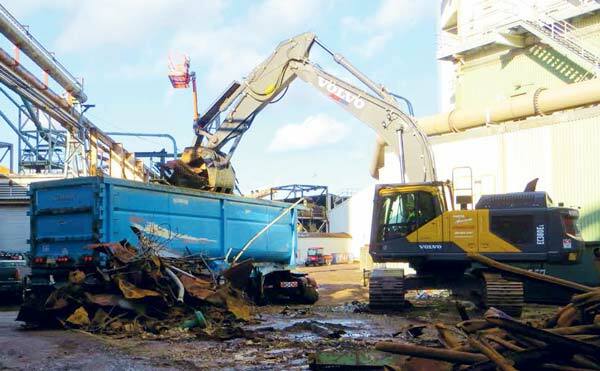 The company has purchased much of that specialized equipment from Alta Equipment Co. in Wixom, Michigan, including in 2014 eight Volvo excavators — EC140, EC160, two EC235, EC300, two EC380 and EC700 units. The company recently purchased a Volvo 700, with a Ultra High Reach Stick, and used it on a project in Spring Grove, Pennsylvania. The structure under the brick had rotted, so North American crews shored it up. The structure was next to another building, not slated for demolition. Working on ever-larger projects in tight quarters, North American Dismantling purchased a CAT 5110. The company selected this ultra high-reach due to the ability to obtain parts and its ability to handle sheers. The ultra high-reach reduces man hours needed, cutting time and safety hazards, while increasing productivity. With an upgraded fleet and an experienced team, North American Dismantling is poised to take down whatever needs demolishing. From selective demos to retrofit- conversion projects, the company provides quality workmanship and cost-effective solutions. information on your demolition project.